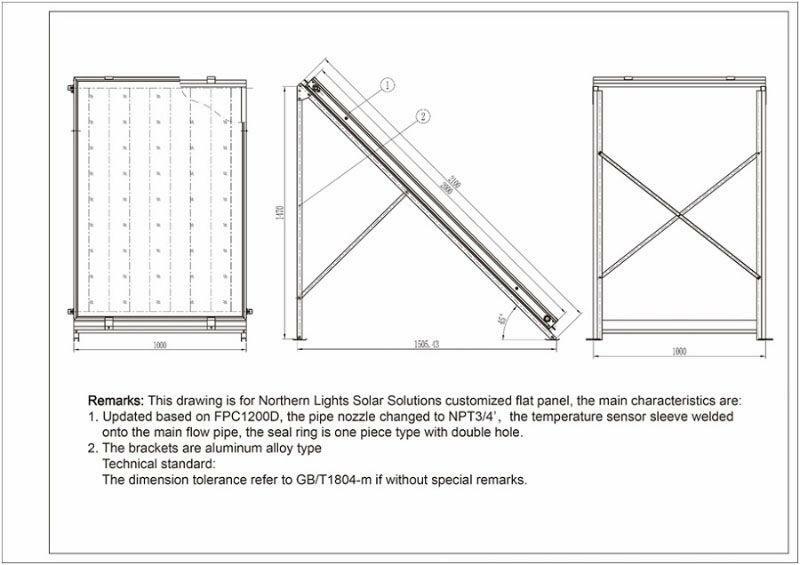 Our Flat plate solar water heating kits are designed for pools and domestic hot water. They are best used in climates with moderate freezing. If you are looking at space heating or live in a climate with cold winters then we recommend you purchase one of our solar water heating system that use vacuum tubes. Because the flat panel solar collectors are optimal for warm climates, there is no need for glycol antifreeze to be used. The smart Resol Solar Controller has an antifreeze setting and will automatically turn on the pump should it detect freezing conditions in the collector panels. This option must be set up prior to installation in freezing zones. Flat plate collectors can be mounted on a roof top surface or a ground mounted at 45 degrees using the optional mounting kit. When mounting panels it is important to make sure they are in the best orientation to capture the southern sun. Ensure minimum shading through the day to maximize their performance. Unlike solar vacuum tube water heaters the installation angle and exposure is more important with flat plat collectors. Maximum collectors to be installed in series should not exceed 6. For larger size system we recommend you connect them in parallel. 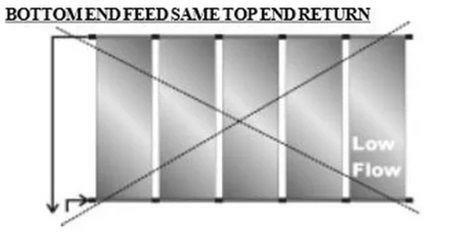 2 parallel rows of 3 collectors will perform better than on row of 6 in series. 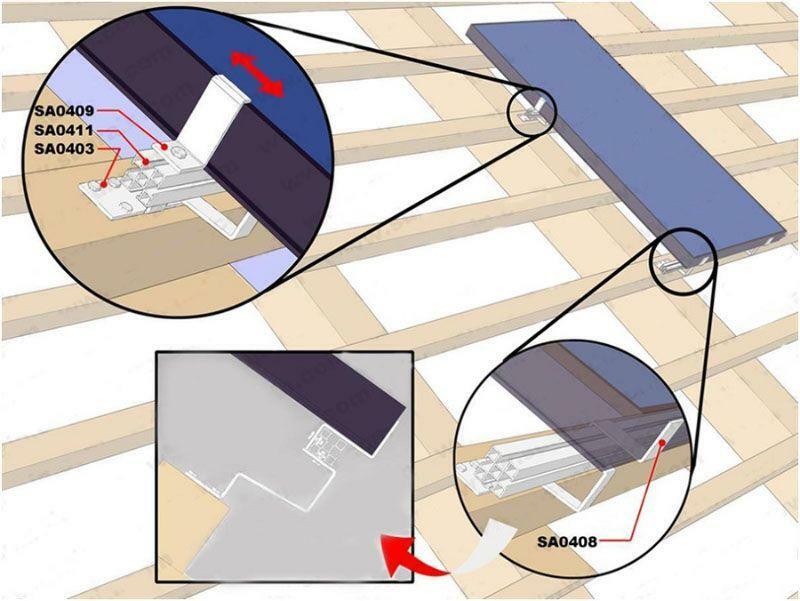 When connecting the panels it is very important to use the technique called reverse return. 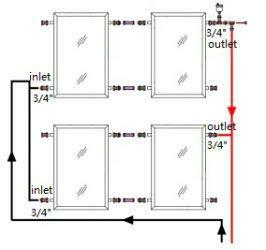 This ensure the pressure drop and flows will be equal across each panel. An automatic solar air vent is included with our water heating kits and will ensure the air is properly removed. This should be installed at the highest point on your solar water heating system. Incorrect – collectors on left will get more flow that the ones on the right. Correct – all collectors will get equal flow and produce the maximum energy. The SunRain FPC1200D comes standard with the roof mount kit but you can also upgrade to the aluminum 45 degree mounting kit. The roof mount includes X & Y axis mounting brackets that allow you to move the feet into any direction such that you can hit a truss and securely fasten the feet. You can slide the feet right or left and up and down. This ensures a fast and secure installation.